Much like everything else in our era of change, the role of a manager is evolving. What used to be predominantly a supervisory and over-the-shoulder type role monitoring the work of others, is now a blend of leader, coach, strategist, project leader, team developer and even team member. The notion of the manager as micro-managing bureaucrat has been retired and replaced with that of a critical enabler of learning and change. The differences between the two views and roles are stark. The former (bureaucrat) is a vestige of the industrial revolution when the focus was on teaching farmers and artisans to do the same task over and over with ever-increasing efficiency. The latter view reflects our world today where uncertainty and volatility in our markets, industries, and firms demand learning and adaptation at the speed of change. For anyone interested in pursuing a career as a manager or in strengthening your effectiveness in the role, this article offers insights and links to help you better appreciate the hard work, challenges, and rewards of managing. While executives are ultimately responsible for major strategic decisions, a firm's managers are the ones working with the people, customers, and teams driving the business. Some managers lead functional groups such as operations, customer service, marketing, finance, I.T., human resources or one of the many other functions found in an organization. Other managers such as project managers or product managers are responsible for working with people across all functions in pursuit of initiatives (projects) or respective product categories. Managers translate the firm's goals into the work of their function. They are measured according to how well their teams perform and meet defined key performance indicators (KPIs), and their success is based completely on the efforts and success of their team members. The role of a manager is one responsible for the work and results of others. As such, a great deal of the work of a manager focuses on building and supporting an effective team. Scouting and recruiting great talent. A strategy is all of the work that goes into determining which customers and markets a firm will pursue and how it will direct its resources to succeed in those areas. 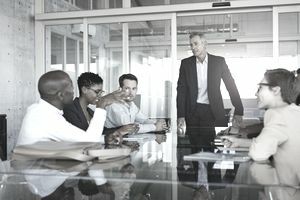 Given the proximity of many frontline managers to customers, partners and the critical functions needed to execute on strategy, many managers are integral parts of the strategy process in their organizations. Developing an understanding of the language and tools of strategy is essential for success as a manager in today's world. Managing is hard work, as is developing as an effective manager. It's much less about telling people what to do and much more about providing, guidance, clarity on goals and coaching and support. Managing in this era is less of a desk job and much more of a hands-on support role with ample decision-making authority. While some modern theories and pundits suggest that the role of the manager is obsolete in our world of knowledge workers, a good manager can be the difference maker in the pursuit of excellence and high performance in our organizations.